Provide comfort for the family of Christina McDonald with a meaningful gesture of sympathy. 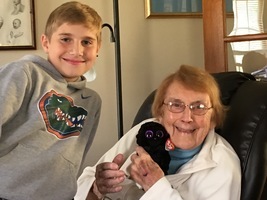 Christina (Diane) Moran McDonald, daughter of the late John and Rose Ann (Turley) Moran passed peacefully Tuesday, March 19, 2019 at home, with her family by her side. Christina was born and raised on the family farm in Brackagh, Co. Westmeath, Ireland and attended local schools there. She came to the United States in 1948 to live with her aunt and uncle, Albert and Nora (Turley) Rosenthal, in Hartford and attended Hartford High Night School to become a US citizen. She worked for the Travelers Insurance Co., Group Department until 1961 to be a stay at home mom. She returned to Travelers in 1977 and retired in 1985. Mom truly enjoyed her time at Travelers and they were good to her affording her great retirement benefits that allowed her to live out her years as healthy as she could be. Christina was the beloved wife of the late Felix Anthony McDonald. Felix died just 6 months ago and was patiently waiting for her to join him in Heaven. They had never been apart before and enjoyed over fifty-nine wonderful years of marriage. She married Felix at St. Augustine’s Church in Hartford in 1959 and moved to Wethersfield in 1963 where they raised a family and stayed until moving to Tolland in 2016. Christina and Felix spent 30 winters soaking up the sun, walking the beach and making new friends in Fort Lauderdale, Florida. Christina’s early years were hard but it gave her great strength, independence and courage. She had lost both her parents and three of her siblings (Kieran, Kevin and May) by the time she was 15 years old. Christina was the last of her siblings; most recently she was preceded in death by her brothers James and John and her sister Kathleen. They are all together again. Sadly missed by her son James McDonald and his wife Maeve (O’Brien) of Milford, her daughter Mary Rose and her husband Joseph Duberek and her only grandchild, Christopher of Tolland. Christina leaves her sister-in-law Joanne Somers Moran and numerous nieces, nephews, grand nieces, grand nephews, cousins, the O’Brien and Peluso/Duberek families and friends in the United States and Ireland. Many of whom came from near and far often to visit and reminisce about days gone by. Her mind was sharp and her memories plenty. A heart felt special thanks is extended to her compassionate longtime caregiver, Carol Mulvey, who made every day a great day. Christina was a devout Catholic and a woman of great faith. She began each day watching the daily mass on ORTV and looked forward to her weekly visits from the Ministers for the Sick and Homebound of the Catholic Community of St. Bernard and St. Matthew. She never complained and saw each day as a blessing. Christina had originally drafted her obituary over 15 years ago, checking it every few years for accuracy. At that time her note, underlined for emphasis, was to not include her age. But in the end, it was her age that gave her such a sense of pride. She lived every one of her 98 years with love, contentment and a sense of purpose. We thought she would live forever. She loved to write her thoughts down and, in a note, left for children she said “Don’t be sad, I’m not. Have a party.” So, in true celebration of Christina’s life and in keeping with traditional Irish customs, friends may call at Christina’s home, located at 120 Valley View Drive in Wethersfield on Sunday, March 24th from 2pm to 7pm. Mass of the Resurrection will start at 11 am Monday, March 25th at Christ the King Parish (Corpus Christi Church), in Wethersfield. Immediately following, burial will be held at Village Cemetery, Old Wethersfield. Family flowers only. If desired and keeping with Christina’s generous and charitable spirit, donations can be made in Christina’s memory to the Tolland Fire Department, Inc. P.O. Box 827 Tolland, Connecticut 06084 or Tolland Cares, PO Box 712, Tolland, CT 06084. Christina’s funeral arrangements have been entrusted to Farley-Sullivan Funeral Home, Wethersfield. For more information and/or to extend condolences, please visit farleysullivan.com. To send flowers in memory of Christina "Diane" McDonald (Moran), please visit our Heartfelt Sympathies Store. Bridget McDonald sent flowers to the family of Christina "Diane" McDonald (Moran). My sincere condolences to the family and friends. May the words at Psalms 94:19 be of comfort to you at this difficult time. Sent to me by a friend, Diane Fitzpatrick. It brought me comfort. The Lanyard By Billy Collins The other day I was ricocheting slowly off the blue walls of this room, moving as if underwater from typewriter to piano, from bookshelf to an envelope lying on the floor, when I found myself in the L section of the dictionary where my eyes fell upon the word lanyard. No cookie nibbled by a French novelist could send one into the past more suddenly— a past where I sat at a workbench at a camp by a deep Adirondack lake learning how to braid long thin plastic strips into a lanyard, a gift for my mother. I had never seen anyone use a lanyard or wear one, if that's what you did with them, but that did not keep me from crossing strand over strand again and again until I had made a boxy red and white lanyard for my mother. She gave me life and milk from her chest, and I gave her a lanyard. She nursed me in many a sick room, lifted spoons of medicine to my lips, laid cold face-cloths on my forehead, and then led me out into the airy light And taught me to walk and swim, and I, in turn, presented her with a lanyard. Here are thousands of meals, she said, and here is clothing and a good education. And here is your lanyard, I replied, which I made with a little help from a counselor. Here is a breathing body and a beating heart, strong legs, bones and teeth, and two clear eyes to read the world, she whispered, and here, I said, is the lanyard I made at camp. And here, I wish to say to her now, is a smaller gift—not the worn truth That you can never repay your mother, but the rueful admission that when she took the two-tone lanyard from my hand, I was as sure as a boy could be that this useless, worthless thing I wove out of boredom would be enough to make us even.